During 2018 Global Petroleum Show, Canada China Commercial Association (“CCCA”), partnering with China Petroleum & Petrochemical Equipment Industry Association (“CPEIA”), is hosting a business banquet to promote the network and business development between Canada and China energy industry. During the event, executives from local energy companies will share their view on the future of Canadian energy industry and the recovery of the oil service sector. Industry experts will also explain the regulations and rule to enter the Canadian energy market. Over 20 representatives from the Chinese delegation to the Global Petroleum Show are also invited to attend the banquet. They will not only bring business and partnering opportunities, but also share their expertise in the energy industry in China. The banquet includes buffet dinner with dim sum station and ample network opportunities. Please join us to promote the cooperation in Canada and China energy sector. Individual ticket: $88/person. Click here to get ticket online. CCCA General Member: $68/person (limit 2). CCCA Business Member: $48/person (limit 2). Partnering Businesses: Please contact us (info@ccca88.ca) if you are interested to become a partnering business. 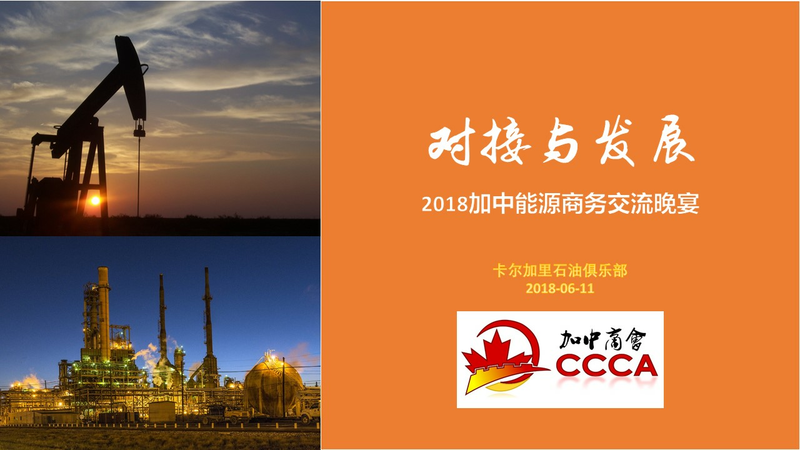 CCCA: CCCA is a registered non-profit organization in Alberta dedicated to the promotion and facilitation of trade development, business investment, innovation and technology exchange between Canada and China. Its principles include resource sharing, strength complementary, mutual benefit and cooperative development between all company and individual members. CPEIA: CPEIA was established in 1985 under the administration by the Ministry of Civil Affairs, China. CPEIA is a non-profit industrial organization with the voluntary participation of enterprises and institutions engaged in researching, designing, manufacturing, supplying and using of petroleum and petrochemical equipment. CPEIA’s over 900 members are from various departments and areas of the country.